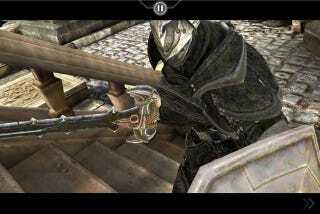 I'm a big fan of Infinity Blade's amazing graphics and interesting take on iPhone gaming. So it's great to hear that the first update for the $6 game is expected to hit next week. The update will include five new swords, five new shields, five new helmets and a new set of armor. The free update also pushes the level cap from 40 to 45, introduces a new enemy and allows you to listen to your own music while playing the game. And all of this is really a preamble to next month when Epic expects their multiplayer update to hit the game. Dueling folks online with absurd swords and shields can't help but be fun.